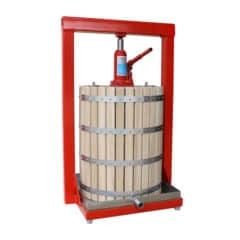 The manual hydraulic fruit press MHP-12W with volume capacity 12 liters is designed as cheap hydraulic press for cider producers with small production capacity. 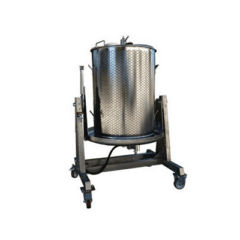 The manual hydraulic fruit press MHP-26W with volume capacity 26 liters is designed as cheap hydraulic press for cider producers with small production capacity. 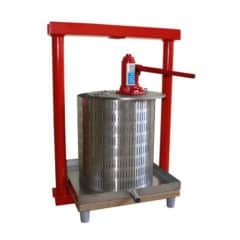 The manual hydraulic fruit press MHP-30W with volume capacity 30 liters is designed as cheap hydraulic press for cider producers with small production capacity. 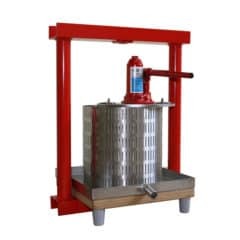 The manual hydraulic fruit press MHP-50W with volume capacity 50 liters is designed as cheap hydraulic press for cider producers with small production capacity. 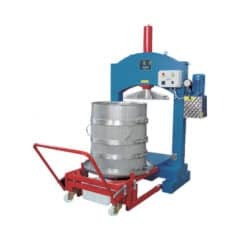 The hydraulic fruit presses HPF-80 with production capacity 80 liters of must per hour are delivered to cider production lines with small and medium production volume. They are more powerful devices than manual presses, yet their price and service demands are significantly lower than most of pneumatic presses. The hydraulic fruit presses HPF-120 with production capacity 120 liters of must per hour are delivered to cider production lines with small and medium production volume. They are more powerful devices than manual presses, yet their price and service demands are significantly lower than most of pneumatic presses. 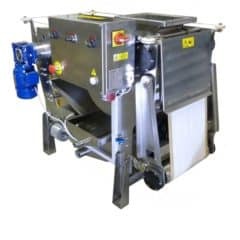 The hydraulic fruit presses HPF-250 with production capacity 250 liters of must per hour are delivered to cider production lines with small and medium production volume. They are more powerful devices than manual presses, yet their price and service demands are significantly lower than most of pneumatic presses. 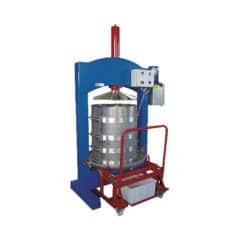 The hydraulic fruit press HPF-600ES is electrically operated machine with stainless steel basket with volume 220 liters. It ais more powerful devices than manual presses, yet its price and service demands are significantly lower than for most of pneumatic presses. This hydraulic press is designed for pressing of shredded apples, pears or other fruits to production of the cider or must. 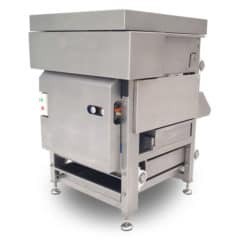 The hydraulic fruit press HPF-700ES is electrically operated machine with stainless steel basket with volume 330 liters. It ais more powerful devices than manual presses, yet its price and service demands are significantly lower than for most of pneumatic presses. 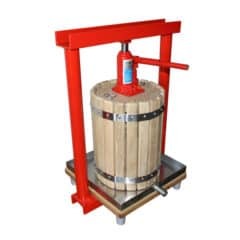 This hydraulic press is designed for pressing of shredded apples, pears or other fruits to production of the cider or must. The belt press FBP-300 is designed for pressing of fruit mass. Fruit mass is placed on the tape which presses it against cylinders. The obtained juice flows in the collection trays under the press. Pressing is continuous. Production capacity 300 kg of fruit per hour. The belt press FBP-300P is designed for pressing of fruit mass. Fruit mass is placed on the tape which presses it against cylinders. The obtained juice flows in the collection trays under the press. Pressing is continuous. Production capacity 300 kg of fruit per hour. This variation of the press is equipped with high-pressure water pump 20 bar for continuous rinsing of fruit pressing belt. 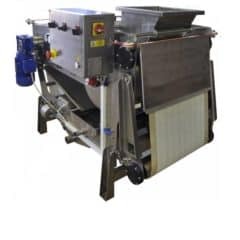 The hydraulic fruit press HPF-800ES is electrically operated machine with stainless steel basket with volume 480 liters. It ais more powerful devices than manual presses, yet its price and service demands are significantly lower than for most of pneumatic presses. 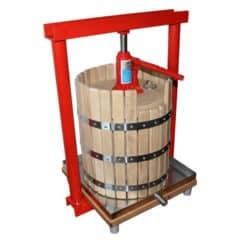 This hydraulic press is designed for pressing of shredded apples, pears or other fruits to production of the cider or must. 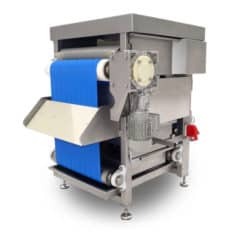 The belt press FBP-300MG is designed for pressing of fruit mass. Fruit mass is placed on the continuous belt which presses it against cylinders. The obtained juice flows in the collection trays under the press. Production capacity up to 300 kg of fruit per hour. 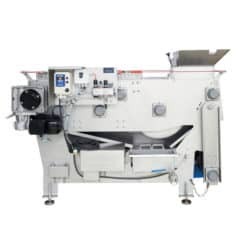 The belt press FBP-500 is designed for pressing of fruit mass. Fruit mass is placed on the tape which presses it against cylinders. The obtained juice flows in the collection trays under the press. Pressing is continuous. Production capacity 600 kg of fruit per hour. 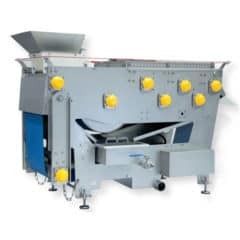 The belt press FBP-500P is designed for pressing of fruit mass. Fruit mass is placed on the tape which presses it against cylinders. The obtained juice flows in the collection trays under the press. Pressing is continuous. Production capacity 600 kg of fruit per hour. This variation of the press is equipped with high-pressure water pump 20 bar for continuous rinsing of fruit pressing belt. The belt press FBP-500A is designed for pressing of fruit mass. Fruit mass is placed on the tape which presses it against cylinders. The obtained juice flows in the collection trays under the press. Pressing is continuous. Production capacity up to 500 kg of fruit (apple, pear) per hour. Made in Austria.